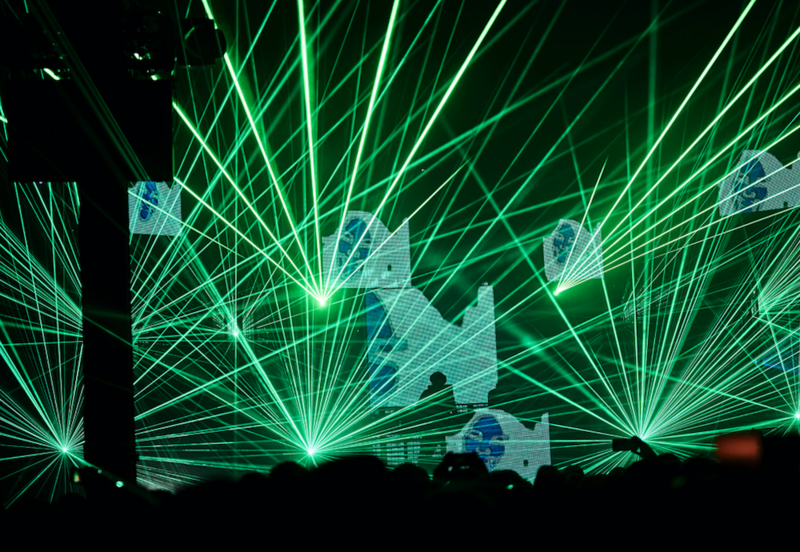 Aphex Twin performed in New York City on Thursday for the first time in decades. A rarity in itself given that it took place at an actual venue and not as part of a music festival, the long-awaited return unfolded very much like the career of the elusive producer thus far: His set was prolific in scope and substance, delivered in the form of a mind-bending, two-hour roller coaster stuffed with unexpected turns and flashes of genius. Minutes before Richard D. James took the stage at Brooklyn’s Avant Gardner, the mood was already being set with circus-like music, the kind that soundtracks a walk through a haunted house. Though maybe random in the moment, the choice was apt for someone like the English producer. Alongside artful, raving renderings of IDM and jungle, Aphex Twin (as well as his countless alter egos) has always operated with a whimsical sense of dark humor at his side. Sparse flickering lights finally ushered in the first wave of Aphex Twin’s performance. As though drawing from his landmark 1994 release, Selected Ambient Works Vol. II, the opening was atmospheric in tone. James stretched that atmosphere, or rather let it linger and permeate throughout the crowd, and soon it felt the whole room was taking part in a mass meditation. The air was also so chillingly still, flushed with held breaths and restrained excitement, that even the slightest, tiniest crackle of percussion — dropped in thoughtfully, precisely, as the English producer does — had audience members in a tizzy. 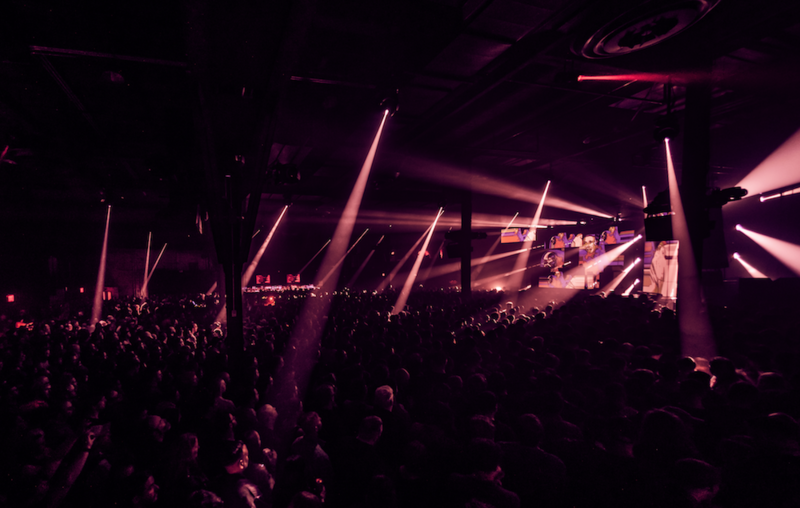 These moments of muted anticipation — and there were many others throughout the evening — seemed to echo Aphex Twin’s 13-year silence between 2001’s Drukqs and 2014’s heralded Syro. Aphex Twin surely knows how to conjure a mood. And he also knows how to pull it apart to reveal fractured pieces of beautifully warped art. Just as Syro ushered in a new streak of releases (see last year’s stellar Collapse EP), James followed his quiet, contemplative act with Aphex Twin in full Aphex Twin mode. No pretensions, no holding back. For the next 60 to 75 minutes, James proceeded to bend, twist, crush, and smack together noise like a frenetic wizard concocting the dizziest, most mysterious of potions. Fluid electronica quickly morphed into skittering, high-octane jungle. Squelches of acid house bled into pounding Berlin techno, and fragmented static melted into a puddle of mind-numbing drone. Much like his own varied albums, which swap moods, BPMs, and more in just a matter of minutes, Thursday’s performance constantly challenged the audience to switch gears right alongside James. To keep up with Aphex Twin is to stare into Berghain’s black hole-like techno and then be transported to a spaceship for acid-tripping aliens in just the blink of an eye. It’s everything at once smashed together, sometimes almost into oblivion, but it’s an exhilarating ride. The set’s accompanying visuals deserve a write-up of their own. 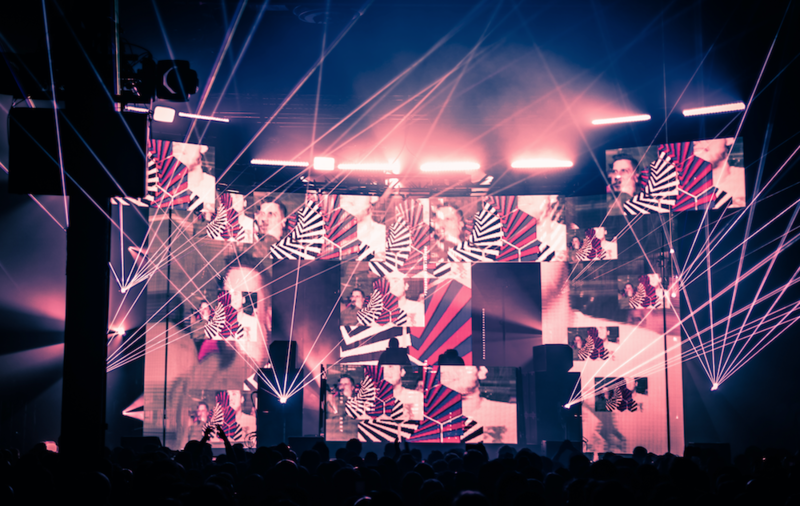 An array of disarraying images and psychedelic laser lights, it seemed to be a visible manifestation of what was being spewed through the speakers. To the awe and amusement of the audience, at one point multiple screens displayed the twisted faces of famous folks; I think I might’ve spotted Notorious BIG, Spike Lee, LCD Soundsystem’s James Murphy, the New York Knicks, the New York Yankees, and Run the Jewels. Donald Trump and even Dan Smith (the famed guitar teacher) were even included. In general, it’s hard to predict what Aphex Twin will do next. It was even harder to guess what he’d do at a show of such epic proportions and expectations. Would he ease us back into his world with the accessible (1996’s Richard D. James), the MTV mainstream terror of 1997’s Come to Daddy? Or perhaps skew toward his other monikers by punching in his 2005 AFX release Hangable Auto Bulb? I should have known that he’d try to do it all. 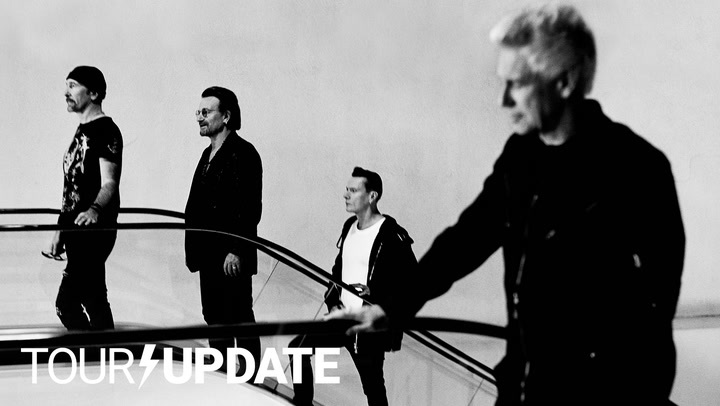 For video highlights from the concert, head to our Instagram page.